The end of September was a busy period in Bay City, Michigan. Just a few weeks earlier the Historical Society and the County dug up the John F. Kennedy Peace Capsule that has been buried on the lawn of the County Building 50 years earlier. Now, on September 25-27 the Veteran's Memorial Park on the riverfront was taken over by the annual River of Time encampment. On Saturday a large group gathered under a tent in the parking lot between City Hall and the Historical Society's Museum to commemorate the City's Sesquicentennial 1865 to 2015. For the celebration, Eric Jylha gave a short history of the area. Ron Bloomfield talked about the opening of the time capsule. Dignitaries like State Representative Charlie Bruner and Mayor Chris Shannon presented proclamations and recognitions. On the other side of the river re-enactors portrayed the history of the Great Lakes and the country in general for the 26th year. 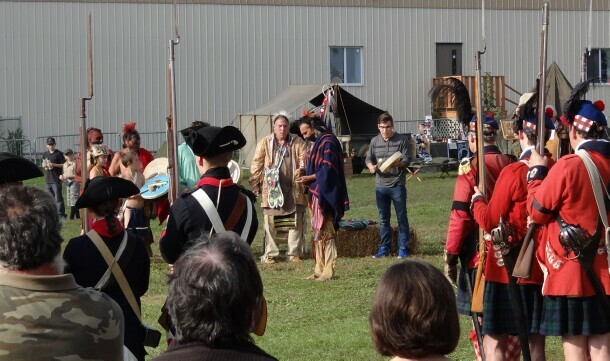 River of Time is one of the largest re-enactments in the region and the only on that covers the entire time-line from French trappers in the 1600's to Revolutionary War, the Civil War, Westward expansion, the World War eras and Vietnam. Friday is traditionally reserved for schools and classes from all over the area come to view living history. Saturday and Sunday are open to the public. The entire weekend is free. Visitors stroll through the park and stop to learn from experts about how people lived in years past. Saturday was full of activities including a fly over by early military observation planes. They came in low and made a couple of passes to the delight of everyone. Later the tall ship Appledore sailed up the river to participate in an naval attack against soldiers on shore. The soldiers seemed to be having fun as every era was represented by guys who wanted to shoot their guns. It was noisy and a delight for all. Highlights of the events are the fife and drum corps that frequently march through the camp. And every hour or so Civil War soldiers fire their cannon across the river. The boom can be heard all over town. The new buildings across the river at Uptown enhanced the boom as the sound echoed back. Many of the re-enactors are old favorites who have been coming to the rendezvous for years. Others are recent additions. Gale Bereus and his son Drew play the part of French trappers and traders from the 1680 to 1740 period. Their camp included an Indian teepee, birch bark canoe, and blankets covered with trade goods from beads to fishhooks and seeds to axes. The pair have been doing this for a number of years and typically travel to about six events a year. They are usually accompanied by another re-enactor who portrays a Native American. Drew went on to explain some of the history. "Trappers and traders would bring their goods into the wilderness and bury caches along the way. They'd later come back and dig up some to trade with the native Indians". He went on to say that the teepee would typically have been a lodge provided by Indian's while the traders were there. The collection of trade goods included many true artifacts. "Some of these are 300 years old" he said. Others, like the cases of beads are modern items. Other re-enactors are familiar faces. Randy Baker, another trapper/trader, drew a crowd to see the big smallmouth bass on his grill. "I got it at a fishing tournament last year. They said this was a small one and were going to toss it to the raccoons. I told them I'd be a raccoon and they gave it to me. I froze it until this weekend." When we came back later lunch was over and all that was left was the head. River of Time is one of the most popular events of Bay City's busy summer of festivals and events. Folks will take a break for a few months of winter fun until things kick off again with next year's Saint Patrick Day parade. See you then.